RIGHT SPEAK: IBD Editorial: Democrats Switch To Plan C To Destroy Kavanaugh — Will GOP Cave This Time? IBD Editorial: Democrats Switch To Plan C To Destroy Kavanaugh — Will GOP Cave This Time? 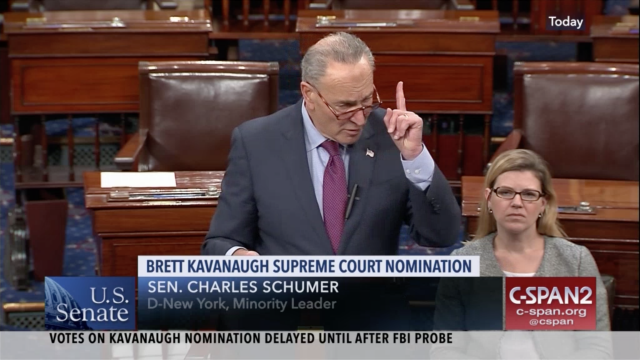 Politics of Personal Destruction: Anyone notice that Democrats have suddenly lost interest in the sexual assault claim they said was central to Judge Kavanaugh's fitness to serve on the Supreme Court? Now it's all about his "temperament" … and what the word "boof" meant when he was in high school. Can this process possibly sink any lower? The New York Times gave the Democrats' new game plan away this week. "For Democrats determined to derail Judge Kavanaugh," the Times reported, "his performance last week before the Senate Judiciary Committee … is proving to be a new avenue of attack, if the accusations of sexual assault are not enough to swing the votes of three key Republicans and two undecided Democrats." Kavanaugh's opponents appear to have all but conceded that Christine Blasey Ford's accusations aren't credible enough to stop his nomination. And for good reason. As Rachel Mitchell, the prosecutor who questioned Ford for Republicans noted in her memo about the hearing, Ford's accusation doesn't even rise to the level of "he said, she said."